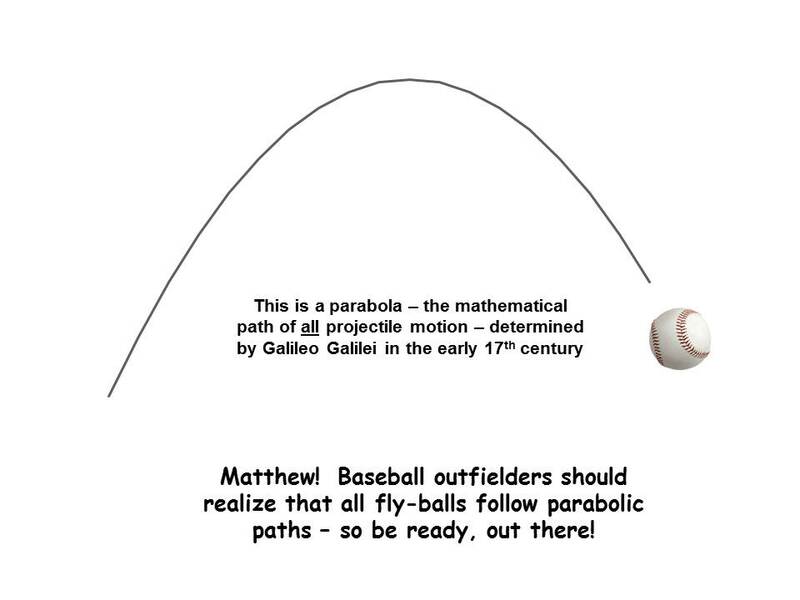 Back to Baseball Basics : Hitting the Ball, for Example! Have you ever been frustrated by some skill that seemed beyond your reach? Who has not, especially in those ability-driven activities, sports and music? I have had three such notable lifetime experiences – two in sports and one in music. As of this post, and, late in life, I am batting two out of three, with one more meaningful challenge left – the art of hitting a baseball. I just purchased this baseball bat! Many fellow retirees might ask, “Why concern yourself with THAT now, in the golden years of retirement?” Are you contemplating a new career in major league baseball? Hardly, but I have a grandson now playing Little League baseball (his first experience), and our whole family is enjoying watching. Athletics come naturally to Matthew – we realized this rather early, with him. He and I enjoy throwing footballs and playing “catch” in the backyard with a baseball and glove, but team athletics pose a different challenge. So far, so good. 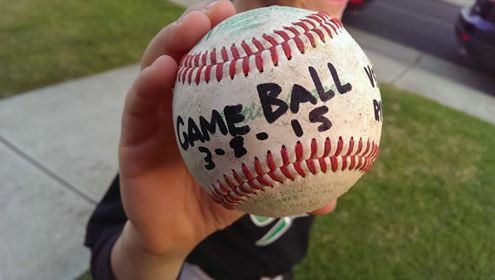 Early in the season, Matthew was awarded the game ball for catching a pop fly for the final out in a close game with runners on base. He can field, he is fast on the base path, and he meets the ball pretty well with the bat. Lurking in the back of my mind is the challenge of becoming a good hitter at the plate. I hope Matthew has more success than his Grandpa did on that score! I vividly recall my challenges in freshman/sophomore high school baseball, and the biggest of all was hitting the baseball. Baseball came along before I found my true calling: Running the hurdles in track during my last two years. I had little confidence hitting at the plate because I had no clue as to “batting mechanics.” I wrote a personal memoir some time ago which included my early sports experiences. Here is a brief excerpt which relates one memorable and somewhat comical experience which accompanied my adventures in the batter’s box: My debut in frosh-soph baseball at San Mateo High benefitted from my treacherous learning curve that previous summer with the Lions. Our coach, Jack Alexander, was a good man who appreciated my effort; he also appreciated the fact that I was only going to help the team by the good example of my attitude and hustle. There was one time, however, when I surprised him – and good! It was a late inning substitution again. I do not recall the game circumstances, but we were playing Capuchino High School from Millbrae/San Bruno. I suspect we were losing decisively late in the game, given the situation. On the mound for them was a pitcher with the reputation of having the best fastball in the league; his name was Daryl W. He was going through our batters like a hot knife through butter. I could see he was a hard thrower for sure, so I stepped into the batter’s box with considerable trepidation. As always, hitting the ball was not something that came easily for me, and even our best hitters were striking out against this pitcher; so expectations were low all around. I stepped in, took a few practice swings, and waited. He went into his windup with a high kick and delivered. From what I could tell, the ball was coming very fast and it looked like it was coming toward my hands; I jumped back from the plate. The pitch came right over the plate with awesome velocity and terminated with a loud tha-WACK! in the catcher’s glove. Despite the great velocity of the pitch, the ball apparently had some real lateral movement as well because it ended up a perfect strike. My first reaction was ….GEEZ! Then, I felt slightly embarrassed for having jumped back from the plate on a perfect strike. My confidence was now even two or three notches lower, and I was just hoping that his control would not falter and that I would not be killed by a fastball to the temple. I steadied myself as he delivered again. I got a peek at the ball coming – this time seemingly right over the plate – and swung for all I was worth. Crr-AACK! I opened my eyes to see that baseball take off like a shot very deep to center field. When I recovered from my surprise, my legs began to churn toward first base. Why, I do not know, but the center fielder was playing back around 350 feet from home plate. He drifted back a bit and caught the ball. I suppose his thinking might have been as follows: in the unlikely case that anyone is able to hit this fastball pitcher, it is going to go deep. There was a lot of excitement on our bench as I trotted back to sit down. I am certain that no one else hit that pitcher harder than I did that day. Some time later, Tom H., who was one of our better first string players, told me how clearly he remembered the way I crushed that pitch. He said Coach Alexander literally fell off the bench when I hit it as did others of my teammates. My baseball experience was both valuable and humbling. I felt quite certain that I lacked the eye-hand coordination required to be a good hitter. In a way, it was much like my inability to hit high notes on the trumpet because of a poorly-suited embouchure [Note: Later proven untrue!]. As with my first athletic experiences at Lomita Park school, it was even more obvious that there would be no easy tickets for me in sports and that hard work and dedication would take me only so far in baseball. Besides, baseball was a team sport where an aura of personal confidence went far in promoting achievement as well as solidarity with one’s team mates. I always got along well with my team mates, but confidence was not one of my personal assets. Nothing breeds confidence like success, and nothing breeds success like confidence; it seemed I was just not able to get a foothold in baseball. The other two especially significant “doing” challenges in my life besides hitting a baseball were: Playing the trumpet, especially in a higher register, and acquiring a strong and reliable tennis serve. My ultimate breakthroughs in these last two endeavors happened long after I began taking trumpet lessons in my early teen years and long after I started playing tennis in high school. Those two personal “triumphs” came about only after careful study and analysis of the technique utilized by trumpet players and tennis stars who had what I wanted – proficient ability. I finally learned how to learn things. Perhaps the Greatest Feeling in the World! The renowned author, David McCullough, expressed it very well when describing the elation of becoming proficient in a challenging task by doing it: “I can do this…and I am getting better!” He stated a canon truth when he maintained that skills like painting and playing the piano cannot be mastered by reading a how-to book; one has to do them! I agree, but I also maintain that the optimal method of learning for us not-naturally-gifted mortals is to supplant the doing with critical analysis of how to do it vs. how we are doing it. Further “doing” then becomes an attempt at experimentation with different approaches and a verification of what works best – working smart, in other words. My experience has revealed, in no uncertain terms, that practicing the same, possibly ineffective approach, over and over and expecting different and improved results is bound to frustrate…been there, done that. When my wife took home movies of my long-term lousy tennis serve many, many years ago, I was astounded at just how lousy it looked, as well. I had no idea – no concept of the inept body mechanics at play. I could immediately see why my serve was so weak and unreliable. Until I made major changes to my body mechanics which were in concert with motion physics (yes, science! ), I got nowhere. Starting from scratch on a completely new serve was not easy and required hours of backyard, slow-motion visualization of my new service motion. It was difficult training new muscle responses, but it worked. The result: A classic-looking, reliable serve, and most important – one with power that really benefitted my tennis game. Back to baseball! I am rising to the challenge, once more, in search of optimal body mechanics… like those of the great hitters in baseball – players like Babe Ruth, Ted Williams, Joltin’ Joe DiMaggio, and Stan Musial. Often, great natural athletes like these know little about the physics of baseball; they instinctively visualize the appropriate body mechanics and efficiently proceed to convert them into automatic reflexes. The rest of us can truly benefit from watching the slow-motion and stop-action films so readily available today which reveal the instinctive secrets of the great ones. So…it’s off to the backyard with my new baseball bat for some slow motion visualization of what it takes to produce an efficient and effective batting swing. This stuff keeps me feeling young! I love investigating the whole learning process in sport, and I have high regard for the great coaches in any sport who can quickly and efficiently improve the athletic performance of young athletes by sharing their hard-won knowledge and insights into optimal technique. 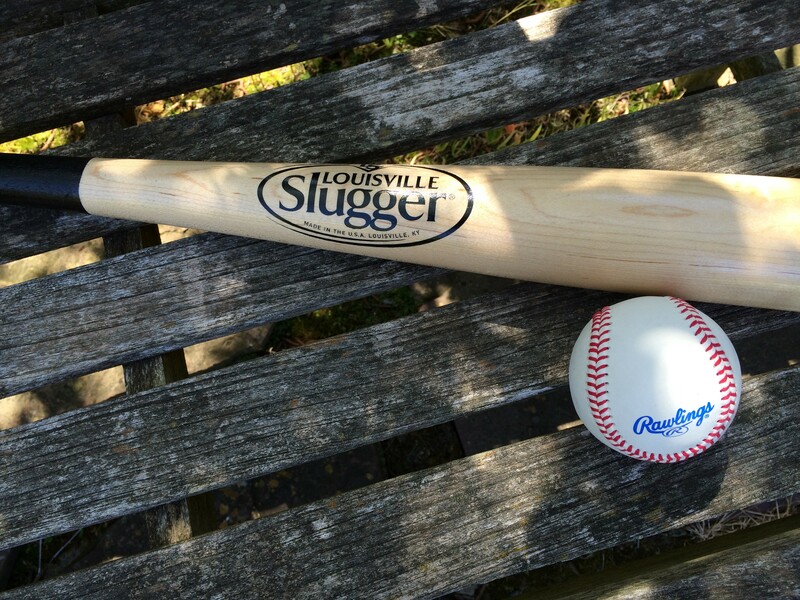 I have aspirations that I might even finally learn how to hit a baseball: Hmmm….better late than never. Yes, I am confident that I can learn to do that – the last remaining item on my lifetime big-three list of personal challenges. Make no mistake, there have been and remain many others, as well. These three were merely among the most vexing. More importantly, I hope that I can be a baseball resource to my grandson, should he ever need any extra coaching. It may happen that the tables might be turned and Matthew will be the one who shows me how! Either way, it’s a win-win situation. Last Wednesday, I was taking care of my two grandsons, Matthew and Luke, while daughter Ginny enjoyed a much-needed respite at our local Peets coffee house. Life has been very busy for her and husband Scott who has been back on the east coast for several days. Peets is her favorite place to sip tea, meditate and work on her blog and books-in-progress. She desperately needed a short break from the kids to just unwind and have some quiet time to write. When Ginny asked if I could watch the boys for a while, I said, “Sure.” I love spending time with my grandsons…and my two granddaughters whom we do not get to see as often because of distance. The two boys are really great kids, but they do keep Mom hopping when Dad is not available to share the load. Matthew will be entering the second grade this fall and loves sports – especially soccer, football, and baseball – and he is very good at all of them! Luke is going into Kindergarten and, being two years younger, is not yet the accomplished athlete that Matthew is. While Matthew and I played baseball catch in the backyard, Luke got busy with a plastic “fat bat”, a “whiffle” ball, and a T-ball hitting post. He is now beginning to hit that stationary ball much better off the “T.” Matthew, as usual, was pleading for greater challenges in the form of high fly balls and, characteristically, was making a lot of circus “near-catches.” I say “near-catches” because the tennis ball we were using with our baseball gloves, would often pop out of the hollow of his glove after he made some pro-style moves to even get his glove on the ball! We were using a tennis ball because we could not find my baseball. A Teachable Moment is at Hand! I, too, was having trouble holding on to the tennis ball; it all too often popped out of my glove, even in routine catches! I thought briefly about why we were having so much trouble catching the ball. Here was a teachable moment, an opportunity to explain to Matthew why a tennis ball is considerably more difficult to catch than a regulation hardball as used in baseball. One might initially think it would be the other way-around, but no. Newtonian physics, as gifted to us by Sir Isaac Newton in 1687, can supply the reasons why catching a tennis ball is more challenging. A baseball is easier to corral in a baseball glove than a lighter tennis ball for two primary reasons. First, the hardball has a greater mass (mass is a measure of the amount of atomic material present in an object…and related to its weight) than does a tennis ball. Even so, a tennis ball dropped from a tall platform has almost the same velocity profile in fall as does a heavier baseball. If we neglect the small effects of air resistance, they both will fall exactly side-by-side despite the difference in their masses, and consequently, their weights. Give Galileo Galilei credit for that revelation – early in the seventeenth century! The mathematical product (multiplication) of a body’s mass and velocity yields a quantity called “momentum” in physics. Two falling bodies with the same physical shape and size (like a tennis ball and a baseball) will make depressions in a sand-pit which reflect their individual momentum at impact. If the two velocities are equal at impact, a deeper impression in the sand will be made by the more massive of the two, due to its greater momentum (and kinetic energy, too). 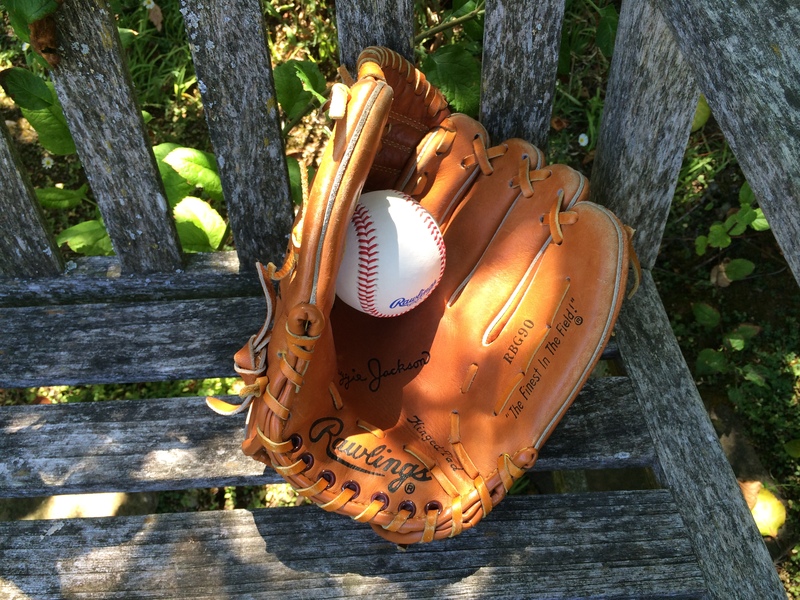 Substituting a leather baseball glove for the sand-pit, the heavier baseball will burrow more deeply into the leather “pocket” of the glove than will the tennis ball. If the baseball’s trajectory is slightly misaligned with the center of the glove’s pocket as the ball enters the glove (the fielder’s fault! ), it soon reshapes the pocket as it burrows deeply in – and it stays put. A tennis ball will not burrow deeply; in a similar circumstance, it tends to quickly “ricochet’ off the side of the pocket without significantly burrowing in. That gives the fielder little time to react and squeeze the glove around the ball, thus capturing it. A tennis ball is elastic, or “springy,” and that, in conjunction with its lighter mass, enables it to rebound quickly off the glove before the fielder can react and “squeeze” it. The elasticity of a tennis ball constitutes the second reason that catching a tennis ball presents a special challenge. I explained this to Matthew, and, bright boy that he is, he seemed to understand at a certain level. I long ago deduced that he is a natural athlete, one of those youngsters who instinctively understand body mechanics in sport, almost without coaching. At quite an early age, he was “whacking” whiffle balls off the “T” post with great power and relatively little instruction from me or anyone else. This also held true for the much greater challenge presented by balls which were pitched to him. He is very quick on his feet and with his feet. When Linda and I play soccer with the boys, it is now almost impossible to contain Matthew once he begins to take the ball down the field toward the goal. As a former track man in high school, I can still run at seventy-three years of age, but I am rapidly becoming no match for my seven and a-half year-old grandson. Natural athletes come with a seemingly built-in physics “primer” which operates at a sub-conscious level, allowing them to more easily do the things they do. Physics principles are at the heart of all high-performance endeavors – especially sports, and even music! There are many sport clinics today which utilize complex technology to visually display and analyze body mechanics for athletes – even weekend duffers who are attempting to improve their golf swing. In addition to other gifts like foot-speed, natural athletes have the ability to visualize their body mechanics without cameras and to sub-consciously employ sound physics principles in their technique and in their performances. Fun for Grandpa Who Loves Sports and Physics! I love the chance to inject physics into sport, for the edification of my grandchildren. The combination of sport, body mechanics/coaching, and physics is a fascinating trio of disciplines which, when mastered, combine to make champions and prodigies of the lucky few. As for me, I have had to methodically learn much of what I have done in sports and music the usual way – through hard work! Much effort, experimentation, and analysis was required on my part to discover “the correct/best way.” Such learning experiences and the resulting insights have proven to be quite satisfying in their own right over the years – as compensation for the struggles. With my grandsons and my older granddaughters, I relish the opportunity to witness, first-hand, life’s learning processes whereby some people must work hard for their accomplishments while others can go farther and more quickly in the challenging disciplines of sport, music, and academics. The grandkids are truly a blessing in so many ways. If they do not turn out to be champions, prodigies, or geniuses, I will love them none the less. It is the journey well-traveled, not the ultimate destination that really matters in life. Charles Darwin, known for his scientific curiosity and intellect, was, in addition to a great scientist, a devoted father and grandfather – a great family man. I recall reading the stories of how he loved observing his offspring and their development, much as he loved observing nature in general. They were to him, not some scientific experiment to be recorded in his notebooks; rather, they were a precious window on life’s processes and human nature which afforded him a most wonderful, satisfying, and entertaining view. I get that. A Postscript: Speaking of baseball and natural athletes, there was none better than the great Willie Mays who played his major league baseball in the early years for the New York Giants. I think Willie knew all he needed to know about the physics of baseball without ever taking a physics course – he was born with an instinctive knowledge of the subject along with other major gifts. I will never forget my personal memory of, undoubtedly, the greatest outfield catch in the history of baseball. A claim like that in sports almost always invites rebuttals and accounts of something even better. This is one of those rare instances where there really is no dispute. The play was especially notable because it occurred in a World Series game and very well may have determined that series outcome. The fact that the series was nationally televised and the game was played in New York only added to the drama. “The Catch” occurred on September 29, 1954, during game one of the 1954 World Series between the Cleveland Indians and the New York Giants. The scene: the old Polo Grounds in New York, the Giants’ home park, with its cavernous outfield. With the score tied 2-2 in the top of the 8th inning and men on first and second base with no outs, Cleveland had a marvelous opportunity. Cleveland slugger Vic Wertz was at the plate. Wertz crushed his fourth pitch to deep center field where Willie Mays was playing rather close-up to the infield. Mays wheeled around, and calling on his great foot-speed sprinted straight out to the 420 foot mark in the cavernous Polo Grounds stadium. 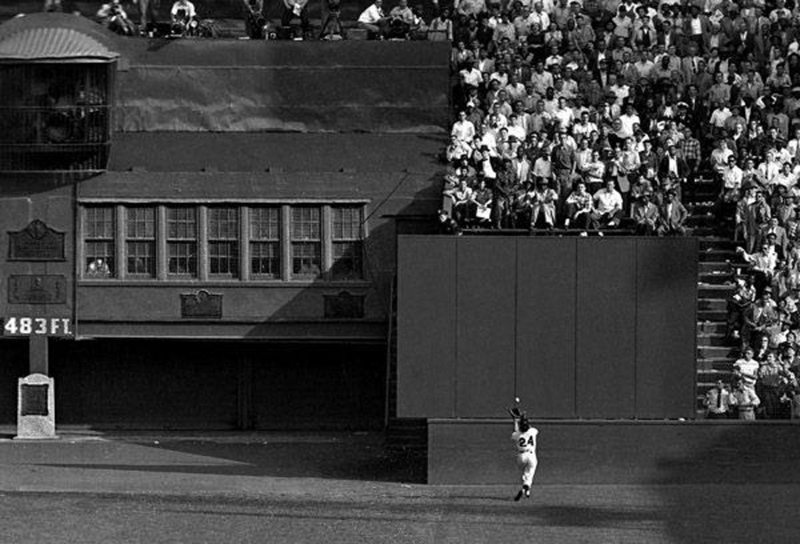 As the ball neared the grass at the tail end of its towering trajectory, Mays, still on a dead run directly toward the center field bleachers, stretched out his glove and caught the ball as it came directly over the back of his head. How he could even have seen where the ball was as it passed over his head is a mystery exceeded only by the miracle of such natural ability. Most would agree, there was probably no one else playing ball at the time (and likely, since) who could have made that catch on that big stage. The instant Mays had captured the ball in his glove by literally outrunning it, he stopped, wheeled around and made a great throw to the infield to keep the runner at second from scoring after tagging the base. The side was subsequently retired with no runs scored, and the Giants went on to win the game and sweep the series. On that sunny September day in 1954 I was a freshman at San Mateo High School, leaving my algebra class and heading to my next class. Someone had a radio nearby, and I had the privilege of hearing that catch “live,” and I do consider it a privilege! I was quite a Cleveland fan at that time, and I was bitterly disappointed at that moment. When Wertz connected and the announcer shouted, “There’s a long drive waaay back in center field….waaay baack…,” I thought Cleveland had this game in the bag. That was just before Willie Mays made a statement that is still heard today. What a ballplayer – probably the greatest ever! What a memory! In the fall of 2012, my wife and I vacationed in New York State. We spent several wonderful days in downtown Manhattan and then headed off to upstate New York. 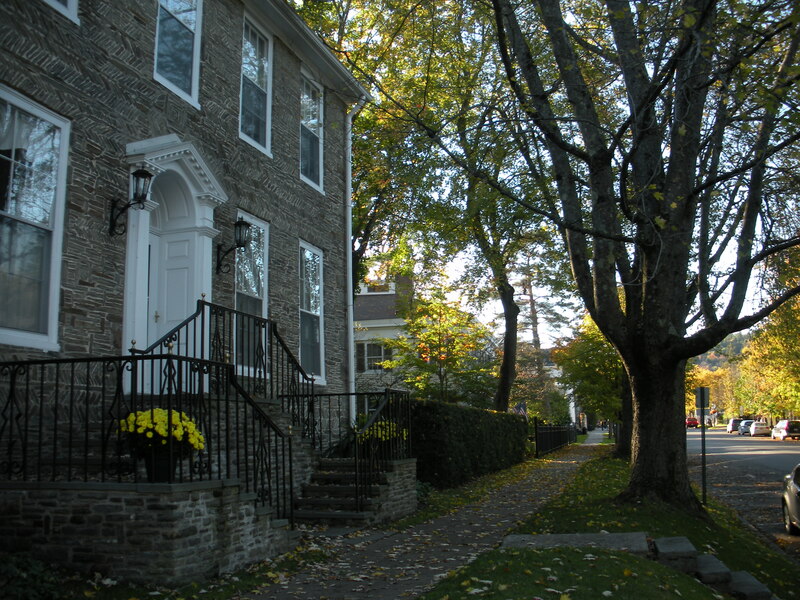 Our major destination, there, was the town of Cooperstown, a place very familiar to our son-in-law who grew up not far from there. I was well aware that Cooperstown was the home of baseball’s Hall of Fame and that the town was connected with the author of the classic Leather-Stocking Tales, James Fenimore Cooper. 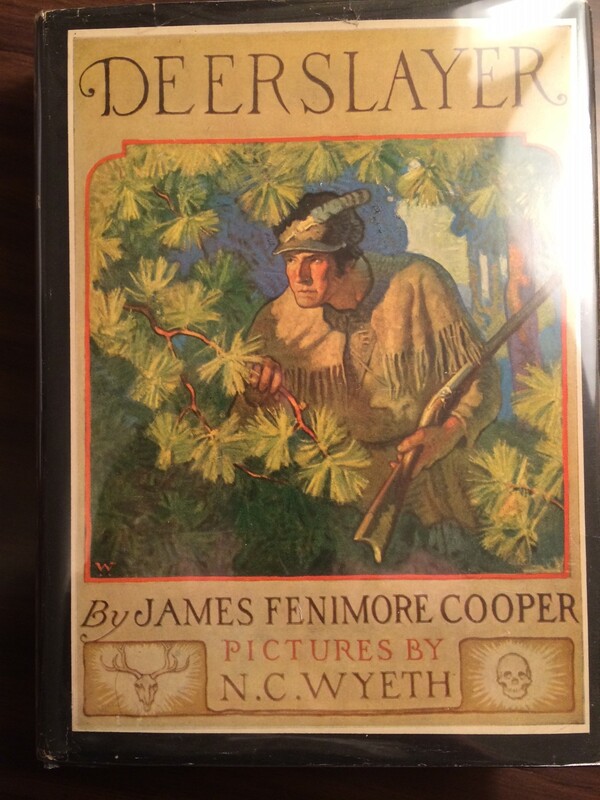 Among his great book titles in that series are The Last of the Mohicans, and The Deerslayer. What I was not prepared for was the charm and beauty of the town and its surroundings. 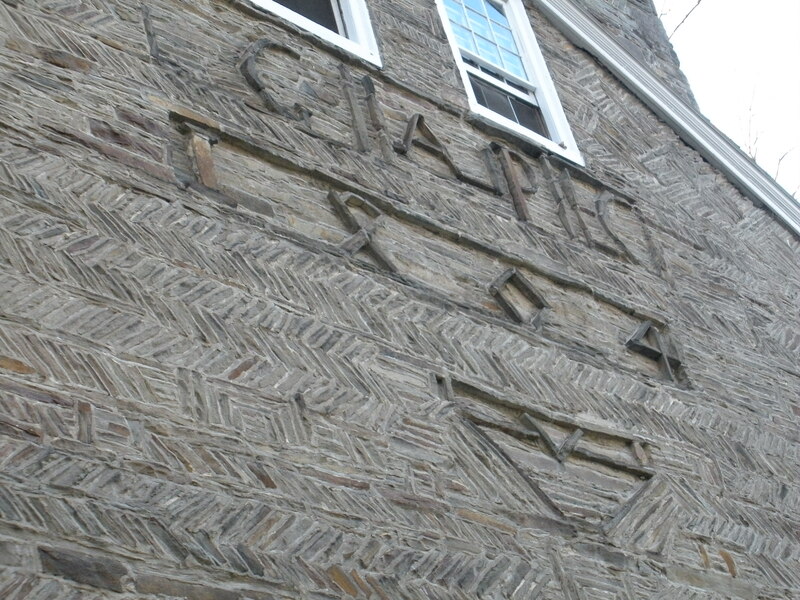 The downtown heart of Cooperstown is not very large, although the surroundings stretch well beyond the town center. 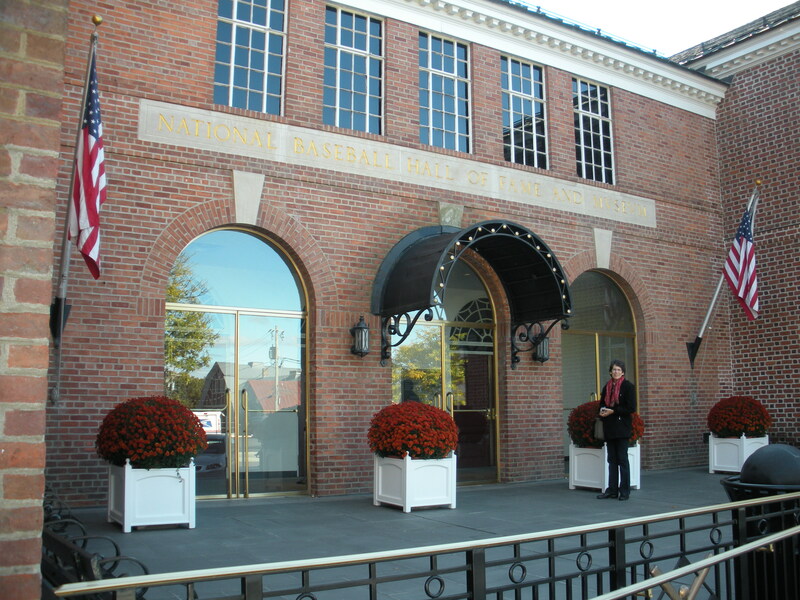 The Hall of Fame is located right in the middle of town, and, except for the times when special baseball events are held there, blends-in surprisingly well with the small-town ambience. During those spring baseball events related to the Hall, all but the most rabid baseball fans and folks who love crowds would be advised to stay away. One of the most interesting sights in the heart of town is the old Pomeroy House which still stands regally on the corner of Main and River Streets. In 1801, George Pomeroy arrived in the area from Albany, New York. He was the first druggist in the town (and the county), and he quickly became enamored of seventeen year-old Ann Cooper, the daughter of the town’s founder and early settler, William Cooper. Ann was the sister of James who adopted his mother’s maiden name, Fenimore, and become known to the world as James Fenimore Cooper. Cooper went on to pioneer the genre of American fiction with his rough-hewn tales which were so influenced by the landscape in which he lived. And, yes, there were Indians all around the region at that time. 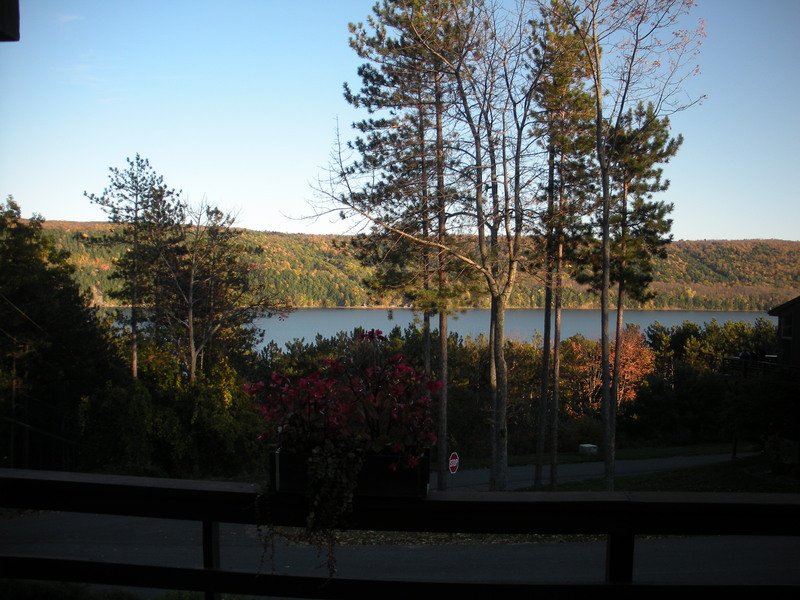 The Deerslayer, one of his best titles, takes place prominently in and around Lake Otsego, several miles from the town center. We spent our last evening there, overlooking the lake. That following October morning when we left, the air was a chilly 25 degrees, and a mist hung over the lake. We were worried about snow…but that would have been a sight to behold. All of this is wonderful history, frontier history, and it could not have taken place in a more beautiful setting!